NEW YORK — Large commercial vehicles compete for space on America’s roadways every day. They become a dangerous presence for everyone else sharing the road. From motorcyclists to SUVs, anyone outside of a tractor-trailer knows the tractor-trailer prevails in nearly every crash scenario. As more merchandise needs to be delivered across the country, more big rigs clog the streets. Deaths from crashes involving large trucks have been rising, with more than 4,300 people killed in 2016. While technology has helped reduce the rate of crashes through forward-collision warning (FCW) and automatic emergency braking (AEB) systems, which are now standard in most passenger vehicles, more can be done to make trucks safer. Many of the nation’s large commercial trucks are more than ten years old, meaning they were built before crash-avoidance systems became available. According to a report by Securing America’s Future Energy, only about 15% of large commercial truck fleets had collision-mitigation systems in 2015. Studies indicate that if certain features were available in big rigs, they could considerably reduce crashes. The Insurance Institute for Highway Safety estimates that there are about 107,000 car accidents each year, 28% of which involve large commercial trucks. If these trucks were fitted with FCW, AEB, blind-spot warning, lane departure warning, and stability control technology, many of these accidents could be mitigated. Industry experts believe these features should be available as standard features in trucks and that it’s more important to have them on trucks than in passenger cars because commercial trucks can weigh up to 80,000 pounds. The consequences of a commercial truck crash against any other vehicle tend to be tragic. Safety tech has taken over passenger vehicles like wildfire; yet, deaths from car accidents continue to increase. With a booming economy, more drivers are on the roads, increasing the odds of deadly accidents. Trucking companies could do their part by equipping their drivers with new trucks; however, they often can’t afford them. 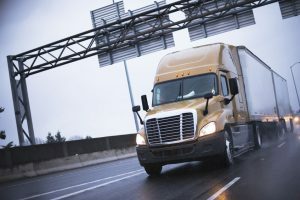 A brand new truck can cost over $130,000 and up to $160,000, according to a spokeswoman for the Owner-Operator Independent Drivers Association. An alternative to buying a new truck may be to install a few key safety features on an older truck. Mobileye, a company that makes advanced safety systems, some trucks could be altered to include a collision-avoidance warning system that features forward-collision and lane-departure warning for just under $1,000. Many truck drivers, however, do not think they need these systems. Some truckers have driven millions of miles without incident and point to the fact that drivers of passenger vehicles are usually at fault for car-on-truck accidents. Driving defensively and keeping your eyes on the road go a long way toward reducing the odds of a crash. Unfortunately, distracted driving is a problem among drivers of all types of vehicles, including trucks. If you are ever involved in a truck crash, the dedicated attorneys at Cellino & Barnes can help you recover the compensation you deserve for your pain and suffering. Our team has successfully worked on cases in all 50 states, and we could help you get the best results possible from your truck accident claim. Contact our firm to receive a free consultation.